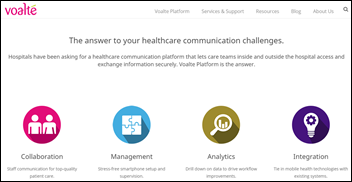 Hill-Rom will acquire mobile clinical communications vendor Voalte for up to $195 million. Hill-Rom hopes to enhance its point-of-care delivery of actionable insights and to drive its growth and margin. Voalte’s annual revenue is $40 million. It has 200 healthcare customers. From Grand Padano: “Re: Athenahealth. Any plans to interview its new CEO? The chatter about what’s happening there post take-private is enormous.” I usually turn down interview requests from companies whose CEO is a new hire (thus giving us little to talk about except his or her optimistic plans) and has no healthcare experience (which Bob Segert does not). But I’ll consider it. I agree with Judy’s point that while doctors often don’t find their EHRs to be empowering and don’t enjoy the time required to feed the beast with their laboriously typed (or dictated) information, surveys don’t always tease out details about the software vs. the rules it enforces that someone else has saddled users with (the “someone else” being insurers, the federal government, and the frequent worst enemy of doctors – their employers). Site-specific implementation issues are often involved, primarily setup, training, support, and ongoing communication about why the system works as it does. EHRs may well have usability issues, but saying that EHRs specifically cause burnout (rather than being associated with it) is like saying that Word and Outlook burn us out when what we really hate is being overworked and underappreciated, being used short of our potential, being required to provide documentation that does not benefit us, and losing our idealistic view of our profession that turned out to be just another crappy job working for faceless overlords. If Epic or another specific EHR were actually causing burnout, it would be reported by nearly every clinician user of those systems, and I haven’t seen that to be the case. The VA’s VistA, one of the most antiquated and ugly systems ever built, has high user acceptance and minimal reported contribution to burnout because it has the luxury of focusing on what a doctor needs to deliver care rather than for billing, a situation that exists nearly nowhere else. 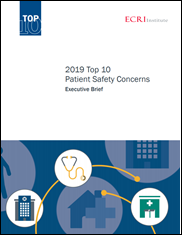 It will be interesting to see how its replacement with Cerner, which was built around billing and administrative requirements, is perceived by those same doctors. The argument that all EHRs cause burnout is also an argument that the software isn’t the problem. Those systems look and work wildly differently, with the only common ground being that they were chosen by organizations who wanted them to work in a certain way. I haven’t seen much evidence that doctors universally love any EHR despite the vendors of those system exploiting every competitive advantage they can find. It’s easy to hate the lawnmower when what you really hate is mowing the lawn. EHR design and implementation decisions reflect what the decision-makers want and those aren’t the same people who actually use the EHR. 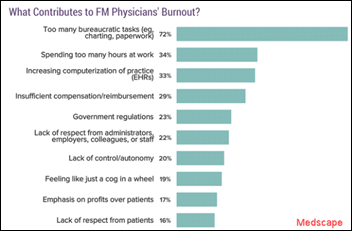 Burnout is not consistent across specialties even though many of them use the same EHR to varying degrees. Working conditions often require doctors to complete their work after hours at home using the EHR, making it likely they won’t love it. Asking Judy her opinion makes for great click-bait for dopey journalists looking for Twitter fodder, but doesn’t otherwise mean a whole lot. She doesn’t have to defend selling the market-leading product or to speak for the entire industry in explaining why the health systems that buy EHRs are somehow wrong. The bottom line is that EHRs or not, physicians would be burned out because of the demands made by those who pay them. All bets are off if you treat them like a monkey that gets fed only after dancing to organ music. Epic can’t fix that. From Pointed Rejoinder: “Re: doctor empathy via robot. Not possible.” It may be unreasonable to expect skilled doctors, especially those such as surgeons and ED doctors whose services are one-and-done, to also be empathetic in a non-phony way to someone they don’t know. Still, nurses do it well all the time and I’ve seen some of our nastiest surgeons – feared and reviled for their tantrums and intentional hurtfulness toward hospital employees – behaving remarkably tenderly with a deceased patient’s family, which as a hospital employee always made me wonder if we really are incompetent, if the doctor was just using us as a punching bag proxy for our employer, or if they were simply putting on an act for their paying customers. Maybe hospitals should hire “empathists,” otherwise unemployable amateur actors who can pretend to be empathetic, letting them take the doctor’s handoff after delivering bad news in helping patients and families get through those first painful moments of understanding. 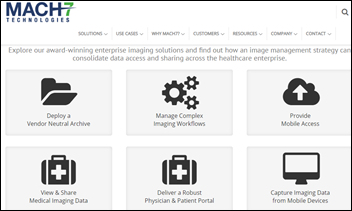 Australia-based imaging software vendor Mach7 announces that it will implement a restructuring and cost-cutting program that it hopes will propel its US growth, firing its CEO and eliminating the CTO role in favor of strategic product management. The company has several high-profile US customers including Penn Medicine, UW Medicine, Brigham and Women’s, University of Virginia Health System, Adventist Health, Sentara, and Broward Health. Business Insider notes that companies such as Hims and Roman that send lifestyle prescriptions directly to the customer’s door often use TruePill, which aspires to the Amazon Web Services of mail-order pharmacy by offering itself as a B2B API and fulfillment service. 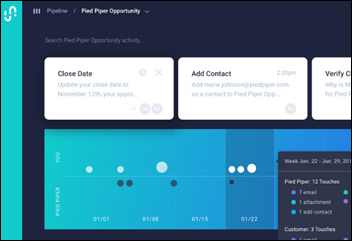 The technology-focused company can send 100,000 orders per day and allows companies to control the patient experience in the form of custom packaging and shipping options. Co-founder Sid Viswanathan was also a co-founder of a business card scanning company acquired by LinkedIn, while CEO Imar Afridi was working as a CVS pharmacist two years ago. The Philadelphia paper questions whether Medicaid-heavy Temple Health — the closest thing to a public hospital in the country’s poorest large city — can survive competition from well-funded and growing competitors such as Penn and Jefferson. Temple is considering selling the cancer system it bought seven years ago, which is its most profitable business, to keep afloat. 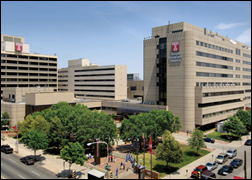 Temple has survived only because the state chips in a non-guaranteed $150 million per year, not only because the health system offers healthcare services, but because it employs many people. Insurers Cambia Health Solutions and BCBS North Carolina sign a long-term management services agreement in which they will share corporate services and operate in five states under the Cambia Health Solutions name. In Qatar, Alfardan Group and Chicago-based Northwestern Medicine select Allscripts Sunrise Ambulatory, Surgery, Radiology, Clinical Performance Management, Lab, and IPro Anesthesia for their joint project. Chapters Health System (FL) will implement hospice and home health EHRs from WellSky. DrFirst implements an interoperability gateway to provide medication histories to the Missouri Health Connection HIE. Carol Steltenkemp, MD, MBA, former board chair of HIMSS and the Kentucky EHealth Board, is promoted from CMIO to external chief medical officer of University of Kentucky HealthCare. Virta Health, which offers type 2 diabetes treatment via virtual health coaches and a ketogenic diet, hires Derek Newell, MPH, MBA as head of commercial. He was previously CEO of digital health benefits technology vendor Jiff and then president of its acquirer Castlight Health for 17 months. 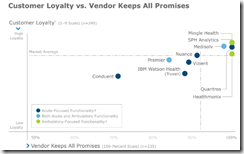 A new KLAS report on quality improvement software finds a near-revolt of users of the worst-performing Conduent and IBM Watson Health (the former Truven). 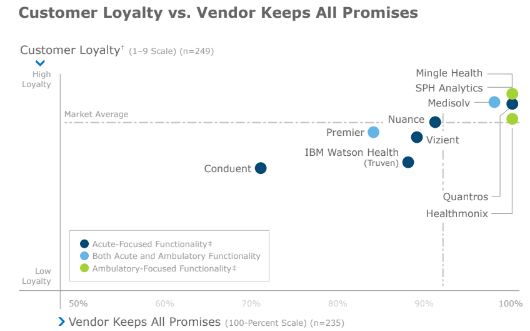 The top-rated vendors for hospitals are Nuance and Quantros, while the ambulatory-focused vendor list is topped by Mingle Health, SPH Analytics, and Healthmonix. 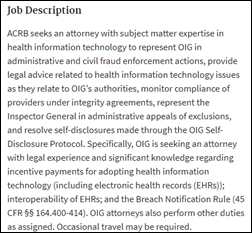 HHS’s Office of Inspector General opens a position for Health Information Technology Attorney, looking for someone with expertise in EHR incentive payments, EHR interoperability, and breach notification to represent OIG in civil fraud enforcement and compliance with corporate integrity agreements. Do something wrong in health IT land and maybe you’ll get to meet the successful candidate. An investment analyst thinks Apple will expand the Watch’s medical sensors and then sell the data of wearers to their doctors for $10 per patient per month, claiming that practices that provide services under risk-bearing contracts would be happy to give Apple a cut. I seriously doubt all of this, but mostly the idea that the Watch is collecting information that will allow doctors to deliver better, more cost-effective care to entire populations. America’s homeless population is fueling a resurgence of “medieval” diseases such as typhus, shigellosis, hepatitis A, and trench fever caused by living in unsanitary conditions. A Health Affairs blog post questions whether CMS’s push to give people easier access to their medical provider-managed information will improve outcomes or improve smart shopping, when instead what is known to work is (a) making easily understood information available when they are making a decision; and (b) allowing them to share in any cost savings. The authors are encouraged by apps such as Apple HealthKit that help consumers understand their data and take action on it, but nobody really knows how they will be used. Optimum Healthcare IT adds ERP to its service lines. AdvancedMD and Aprima will exhibit at the AAOS conference March 12-16 in Las Vegas. Arcadia will host Aggregate 2019 April 24-26 in Boston. Artifact Health will exhibit at OHIMA 2019 Annual Meeting & Trade Show March 18-20 in Columbus, OH. Avaya expands its line of video collaboration solutions with new offerings designed for smaller meeting spaces. CompuGroup Medical will exhibit at the Arizona Medical Association Spring Conference March 16 in Phoenix. Collective Medical releases a video featuring New Mexico Hospital Association Director of Policy Beth Landon. Cumberland Consulting Group will exhibit at the Health Plan Alliance Spring Leadership Meeting March 19-22. Diameter Health will exhibit at the Rise Nashville Summit March 17-19. Re: Epic-Usability and Mr. HIStalk’s comment re: VistA – you nailed it. It will be fascinating to monitor Cerner’s encounter based EHR’s acceptance as well as how they will decide to address functional nuances in the VA (and DoD). Cerner’s EHR is designed for a “clinically driven revenue cycle” – a help or hindrance to the VA and DoD? After 35+ years on the hospital front lines, I don’t think it’s possible to make any generalizations about people’s skill or empathy based on their roles. I’ve worked with surgeons who have a wonderful bedside manner and pediatricians who are rude and gruff. I’ve also worked with amazingly compassionate nurses and with nurses who are sadistic and humiliating to patients. I’ve also seen physicians who ordinarily have the patience of a saint, lose it entirely when confronted by some organizational inanity that compromises patient care. Some of the Joint Commission requirements also rank highly on the “you’ve got to be kidding me” list of annoyances. I’m sure there are plenty of physicians, regardless of specialty, who could speak to a patient via a telemedicine “robot” and convey empathy. So please blame any outrage on the individual purveyor of bad news and not on all physicians or all robots. So Epic pays KLAS, then conveniently cites KLAS research when their product comes under scrutiny. 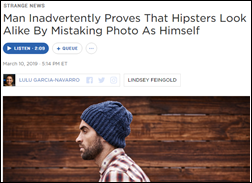 In what world is this allowed to pass as objective, transparent research?